So exactly how did we end up at Grand View Lodge for our Spring Conference? 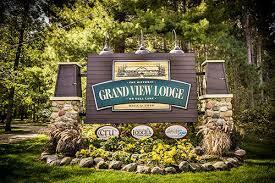 While up at the Spring Conference this year, I overheard some of our more “youthful” members asking if the Spring Conference was always at Grand View Lodge. Well, sit back kids and let me tell you the story. Back in 1944, a group of like-minded public works officials organized as the Public Works Section of the League of Municipalities and agreed to hold an annual meeting in conjunction with the League’s Annual Meeting. It was loosely called the Minnesota Public Works Association, the first time “MPWA” was used. At this point, there still wasn’t a Minnesota Chapter of APWA. It soon became apparent that this Public Works group would benefit by membership in a fledging new association called the American Public Works Association or APWA. At its annual meeting in 1946 in Brainerd, the MPWA voted to make formal application to become a chapter of the APWA. In the fall of 1946 at the National APWA Congress in Ft. Worth, Texas, the Executive Board of APWA voted to approve Minnesota as a Chapter. Technically, from that point on, we were officially the Minnesota Chapter of the APWA (APWA-MN) not MPWA, but that original acronym hung on for many, many years and in fact is still used by some of the old timers even though the name behind the initials doesn’t exist. APWA-MN continued to hold one meeting a year, in conjunction with the annual League of Municipalities. This meeting tended to rotate around the state and was generally held in June of each year. In 1953, the group started having a “chapter dinner” with spouses after the annual meeting. In 1954, a 9-person Membership Committee representing all nine areas of the state was formed to discuss how the Chapter could increase membership. In 1955, APWA – MN started holding one-day meetings in the fall and spring specifically to discuss state aid issues. (Note: the State Aid system was formed by the legislature in 1955.) The annual Chapter meeting was still held in June with the League of Municipalities. For those Chapter members that are also City Engineers, you’ll note that these early days of APWA-MN essentially followed the current CEAM schedule of events, namely an annual summer meeting in conjunction with LMC and two State Aid meetings in the spring and fall. At the 1960 annual Chapter meeting, it was “mentioned” that APWA was holding its annual Congress in Minneapolis in 1961. Things have sure changed, as the Minnesota Chapter was not involved in bidding for the national Congress to be held in Minneapolis that year nor assist in the funding for it (although there was a small item indicating Minnesota was to “supply pencils and manila envelopes” for Congress attendees), whereas at the 2016 PWX the Chapter provided several hundred thousand dollars and over 400 volunteers. By 1965, the Chapter was routinely meeting in the spring and fall at the University of Minnesota, along with the annual meeting with the League of Municipalities. In January 1967, there is a joint conference held between CEAM and APWA-MN at the University of Minnesota. Don’t worry folks – I haven’t forgotten about Grandview Lodge. It’s a long way to get there, but I’m working on it. Any good historian has to spin a long story to get to their point. In 1970, APWA-MN started meeting regularly in January or February at the Holiday Inn Central, along with continuing its’ annual Chapter meeting. In 1977 at the annual meeting in June, members voted to officially begin the concept of a “Spring Conference.” It was also voted to hold an annual conference in November and call it the Fall Conference, which rotated between the Sheraton Northwest and the Thunderbird Hotel in Bloomington. It appears at this point, official ties with the League of Cities was broken as they continued to grow their relationship with CEAM. APWA-MN no longer had a chair on the League’s Executive Committee. The first annual Spring Conference was held in 1978 at Cragun’s resort. Seventy-three members attended the two-day conference. Chapter membership totaled 495 members. Also, in 1978, the first-ever official Fall Conference was held at the Sheraton Northwest. In 1981, records show that the Spring Conference was moved to Grand View Lodge. Chapter officers were: President, Melvin Johnson (St. Cloud); Lloyd Pauly, Vice President (Minnetonka); and Richard Koppy, Secretary/Treasurer (St. Louis Park). Those of us that know Lloyd are probably chuckling at his name and are not surprised that he was involved in this decision as he was a mainstay at Grand View. For those of you that don’t know Lloyd, he was the 1982 Chapter President, past Hugo G. Erickson award recipient and very active in the Education Committee and other chapter initiatives for many, many years and a terrific APWA-MN advocate his entire career and long into retirement. The first annual Summer Golf Outing was held in 1983, allowing chapter members “another opportunity to get together in a social setting.” The first year, 136 members and their guests attended at Majestic Oaks Country Club. The Spring Conference has been at Grand View Lodge ever since 1981, except for a 3-year stint between 1999 and 2001 when it was moved to Rutgers. It has changed quite a bit over the years……the days of the formal banquet with suit coats and spouses have been replaced with Hammer-Schlagen in the Loon Lodge…… but the beat keeps marching on. Being able to network and socialize with our peers in the industry, both public and private sector, still has many of the same benefits to the overall Public Works’ mission as it did back in 1978 at that first Spring Conference.